This week we would like to share news from Europol (The European Union Agency for Law Enforcement Cooperation) and Trend Micro Research, together they released the Cyber-Telecom Crime Report 2019. The report explains our excessive dependence on telecommunications technology nowadays and how scammers take benefits from it by carrying out illegal activities. The cost of telecommunications fraud reached €29 billion according to Europol, as advanced technology dramatically increases fraudsters’ capabilities. tellows has already shared figures of the Missed call (the Wangiri fraud) and Vishing calls frauds before. This time we will have a look at International Revenue Share Fraud (IRSF)! These frauds mentioned above are all infamous telecommunications frauds included in the Cyber-Telecom Crime Report 2019. This entry was posted in General, Knowledge, nuisance calls, Telephone Scam, Telephone Spam and tagged annoying, cost trap, fraud, International Revenue Share Fraud, methods of fraud, nuisance calls, scam, scam method, scam numbers, telephone numbers, telephone scam, tellows, tellows.co.uk on Thursday April 18th, 2019 by tellows.de Team. 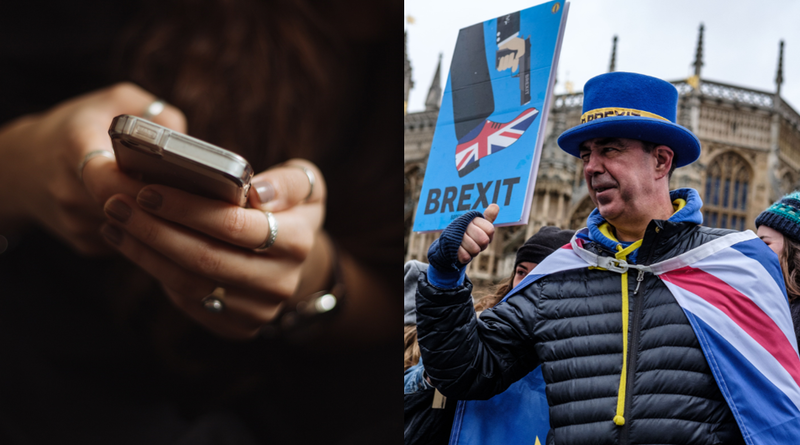 This time tellows would like to share some insights about the impact of the Brexit on phone scams and unwanted calls. As we are all concerned, the Brexit is not only a frustrating process, but besides its own complexity and influences, there is also a very annoying side effect – the Brexit scams. Phone frauds are not strange to us, there are many fraudsters in the UK and we often read news about phone scams. However, Brexit is making it worse by providing these scammers more ways to deceive people. Let’s take a look at the latest four Brexit phone scams. Do you own a business and trade with the EU? If yes, then lets assume you have been told by the government that you have to register for a ‘UK trader number’. Scammers will try to reach you through email, text message or over the phone, and ask for your personal details such as bank account details, internet banking password or offering you a tax refund in exchange for personal or financial details. This entry was posted in General, Knowledge, Telephone Scam and tagged annoying, Brexit, Brexit phone scams, cold calls, fraud, iPhone, methods of fraud, nuisance calls, personal information, scam, scam method, spam, telephone, telephone scam, tellows app, tellows.co.uk on Wednesday April 10th, 2019 by tellows.de Team. If you receive an incoming call from a foreign number, you should be very careful! Fraudsters from abroad use these calls to deceive their victims and steal their money. And although this type of scam isn´t completely new, thousands of consumers fall victim to them every year. Even in 2019, the business with Ping-Calls (referred to missed call scams) flourishes in various countries such as Australia, Germany, Japan and more. Lately we registered an increasing number of reports regarding the “Missed Call”-scam in the United Kingdom on our site tellows.co.uk. However, what is this “Missed Call”-scam and how can you protect yourself against it? This article will answer these questions. Let´s take a look! This entry was posted in Knowledge, nuisance calls, Ping Calls, Telephone Scam and tagged cost trap, foreign numbers, fraud, Missed call, ping call, safety tips, scam on Thursday March 21st, 2019 by tellows.de Team. Last year tellows Study I explored the most communicative countries according to our database, in which Colombia, USA and Mexico took the lead out of 50 countries. In 2019, tellows Study II aims at sharing our latest information of the most reported caller types in countries within Europe, Asia and South America at tellows’ platforms. Alone in the UK, almost 30% of the callers’ type are reported as harassment calls. Surprisingly the most noted caller types actually differ from country to country, let us check out the content below! This entry was posted in General, Knowledge, nuisance calls, Telephone Scam, Telephone Spam and tagged caller types, countries, database, Harassment calls, tellows study, uk on Thursday February 28th, 2019 by tellows.de Team. the first month of the year has passed. We’re very happy that all of our users have contributed to our platform by sharing useful information of various telephone numbers. Last month, we received more than 1200 ratings and comments in UK. The total number has increased by 200 ratings compared to December. 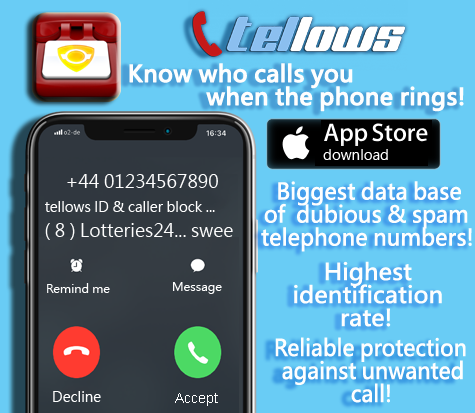 In order to protect you from possible fraudsters and phone spammers, we would like to share some of the most searched numbers at tellows.co.uk. We’ve also added the type of callers and the name of companies, so you can see if the numbers are dangerous or not. This entry was posted in Daily Updates Dubious Numbers, nuisance calls, Telephone Scam, Telephone Spam, Weekly Top 3 Nuisance Callers and tagged fraudsters, january, most searched numbers, telephone scam, top numbers on Thursday February 7th, 2019 by tellows.de Team. 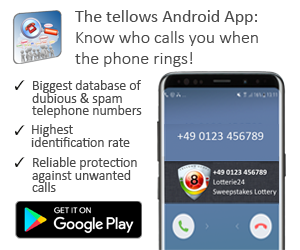 tellows database consists of over millions of telephone numbers reported by our users worldwide. As you can read on our API page, we are always open for any collaboration and partnership by offering the access to our database. 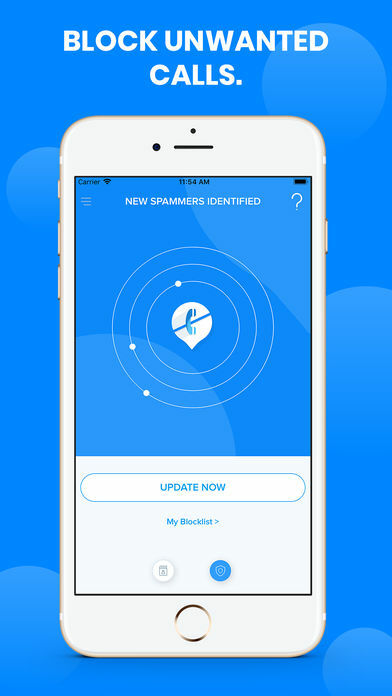 Recently, we made a collaboration with Ever Apps LLC to support its anti spam call app for iPhone with the tellows database. In case you haven’t heard of this application, here’s a quick overview of our new partner app! This entry was posted in App suggestion, nuisance calls, Telephone Scam, Telephone Spam, tellows API and tagged anti spam, App Partner, blocking app, caller ID, iPhone App on Thursday January 31st, 2019 by tellows.de Team. October has always been the European cybersecurity month for the past six years. The European Commission and the European Union Agency for Network and Information Security (ENISA) arranged the occasion to raise awareness of cybersecurity and to provide users the opportunities to protect themselves from cyber-criminals. The focus of the campaign is to give users some useful tips and tricks to prevent themselves from being a victim of cyber scams. These include phishing, smishing, and vishing. In case you haven’t heard of these scams, we have collected information about these types of scams below. Check it out! This entry was posted in Knowledge, Legal, nuisance calls, Telephone Scam and tagged cyber criminal, cybersecurity month, european commission, phishing, smishing, vishing on Friday October 26th, 2018 by tellows.de Team. as you might remember, we have posted an article about fake technical support scam in the beginning of last August to warn you of the rising issue of a Microsoft scam. Microsoft has also released several statements on their official website to warn people about this fraud. Unfortunately, this doesn’t stop scammers from finding other ways to trick people. Recently, we found out that many fake tech support scammers have been using another method to deceive Microsoft users. They take advantage of Microsoft TechNet portals and created over 3000 fake pages. The TechNet portal is usually used by Microsoft users to save documentations of products and images as well as to offer community forums for its users. Unfortunately, the scammers have found a way to use the subdomain of TechNet portal, gallery.technet.microsoft.com, in order to be displayed on Google. Although the pages are usually blank pages with error message, the scammers’ purpose is to display their phone numbers on the headline of the pages. They mostly affiliate the tech support with Bitcoin or Coinbase Helpdesk. The problem has gotten bigger, as the fraudsters were able to rank quite high on google search and their fake pages were displayed on the first page when the users search for keywords such as “Helpdesk Microsoft”, “Helpdesk Coinbase”, etc. This entry was posted in Knowledge, Telephone Scam, Telephone Spam and tagged computer, fake tech support, Microsoft, spotify on Wednesday September 19th, 2018 by tellows.de Team.